The video clips/drills on this page were generously shared by PGC Basketball. Included are three shooting drills, and one defensive drill. PGC summer courses are unlike any basketball experience you, or your players, have ever had. There are no stations, no wasted time, and no endless full-court games with little to no defense. Everything is done with intention. And everything happens with one goal in mind: Ensuring you and your players have the best basketball experience of your lives. 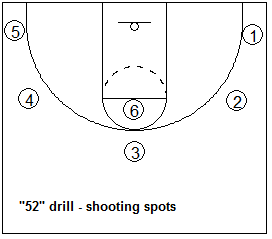 This 2-person drill can be done before practice, with each player making 40 shots. The shooter goes through 8 segments (shot types), making 5 shots in each segment... a total of 40 made shots. This 2-person shooting drill can be done either off-season or during your regular in-season practices. It is a competitive drill, and the best score for the season can be posted in the locker-room. The shooter should focus on being "shot-ready" when catching the pass, and rebounder/passer should make good sharp, accurate passes to the shooter's shot-pocket... no lazy passes. So there are a 10 possible points at each spot, 50 total. We finish the drill with two free-throws (when the shooter is tired), for a total of 52 possible points. This 2-person workout drill incorporates many offensive skills into this one drill... a post move, back-cut, off the dribble move shot, catch and shoot, rebounding, dribbling skills, and passing. This defensive drills starts like a shell drill with 4 defenders scrambling to cover 5 offensive players. When the coach yells "down", a fifth defender comes in and the offense starts setting downs-screens, so our defenders can work on communicating and defending down-screens. When the coach yells "live", it's 5-on-5 live with the offense trying to score and the defense trying to get a stop.